"An excellent thriller that begs for a sequel." The Columbia Review. 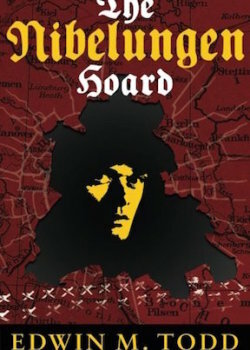 In the best tradition of the great World War II thrillers by Ken Follett, Jack Higgins and Alen Furst, “The Nibelungen Hoard” by Edwin M. Todd captures both the spirit and the intensity of a determined hero’s quest through the stormy waters of a world caught in the clutches of a titan political and military struggle. At the center of the story is Nazi loot hidden away by a disillusioned SS officer back in 1945. But this instigating event, which of course evokes classic familiarity, quickly develops into an original story whose roots are in both national and personal tragedy. The author achieves a perfect mix of dramatic historic events, both past and present (the novel takes place mostly in 1989) with a cast of realistic characters engaged in an intense battle between good and bad. While suspenseful and fast moving, the “The Nibelungen Hoard” builds up a complex plotline threaded with old sins that come back to haunt both sinners victims, even many decades later. Mining the rich depths of the greatest human conflicts of the 20th century (Fascism v. Allies, Soviets v. West), Mr. Todd weaves an incredibly suspenseful and realistic story. With twists and turns that spring naturally from past events and present-time choices, the reader is taken on a fictional yet authentic journey that’s nothing short of memorable. Perhaps most symbolic is the parallel between the roots of the story, back at the last days of WWII, and the climactic events that take place as the Iron Curtain falls, ending the Cold War that grew out of the Nazi era. And, as the story comes to an end, the hero is on his way home, reflecting: “Last night the Wall came down. They were there with the thousands celebrating the end, or maybe the beginning. They made love. How could anything be normal?” In other words, this excellent novel begs for a sequel. We can’t wait.